Hi Friends! Welcome back to Healthy Grocery Girl. Today I’m sharing with you my favorite foods for gut health and digestion! As many of you know I struggled with some gut health issues in my past which thankfully I have resolved through a combination of diet and herbs. Today I’m sharing with you some foods and herbs I try to eat everyday to personally support my gut health. We’ve partnered with my favorite tea brand for today’s video, Traditional Medicinals. I drink their tea everyday and they have a variety of great options for gut health and digestion. So let’s get started! Vitamin C can help strengthen the immune system as well support collagen production. Collagen is a structural protein, mainly found in skin and connective tissues. Collagen may help increase gastric juices, help restore the health of your mucosal lining and help repair damaged intestinal lining. 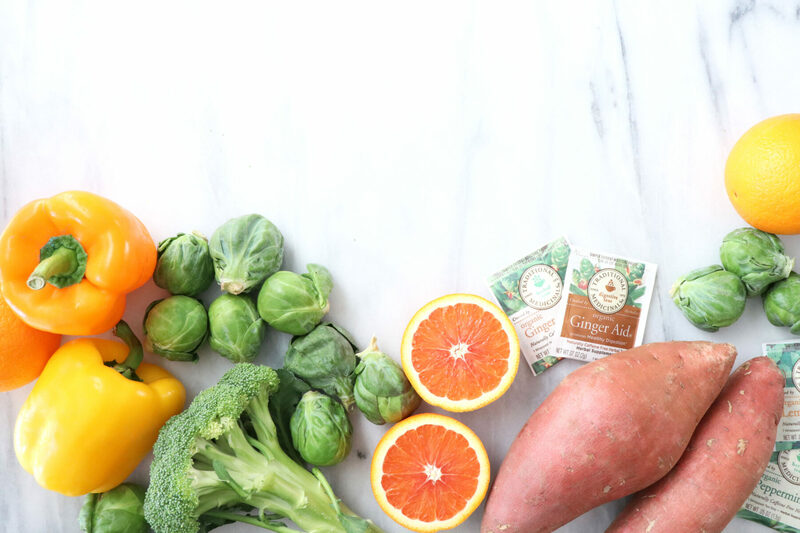 Some food sources that naturally contain vitamin C include oranges, bell peppers, sweet potatoes, broccoli and brussels sprouts to name a few! I love tea and drink multiple cups a day. Tea is a great way to hydrate and nourish the body with plant-powered herbs. Traditional Medicinals Ginger Aid®, Ginger, Lemon Balm and Peppermint are also known to support digestive health. All of these herbal teas I still enjoy during pregnancy except the Ginger Aid®. I purchase most of my Traditional Medicinal teas from Sprouts however they are widely available at so many different stores. To note, because every pregnancy is different, it’s always best to check in with your prenatal healthcare practitioner on which herbs are best for you. You are likely familiar with the word probiotic. Probiotics are good, living bacteria naturally found in our digestive tract. Probiotics may help strengthen the immune system, improve digestion and gut health, hormone health and have even been linked to better breath, healthier hair, skin and nails. Food sources include Kombucha, Kefir, Miso Soup and Apple Cider Vinegar. You can also take a probiotic supplement. Make sure that your probiotic supplement is quality and refrigerated. Prebiotics are essentially the food or fuel for probiotics. They help increase the friendly probiotics in our digestive system. Foods sources of prebiotics include garlic, onions, leeks, asparagus, bananas, oats, barley, apples and flaxseeds to name a few. Bone broth contains collagen, which we now know is helpful in restoring gut health. You can make your own bone broth or buy a quality organic version at the grocery store. It’s a great broth for soups or use in place of water when cooking grains like quinoa or brown rice. This is not a food to eat, but a general gut-healthy rule to follow. Sugar is food to bacteria. We have combination of good and bad bacteria in our digestive system at all times. Problems can arise when the levels of bad bacteria outweigh the good. A diet high in sugar can support bad bacteria growth. If you’re struggling with digestive issues or you have in the past and would like be preventative, aim to consume a low sugar diet. The easiest way to do this is to eat mostly real, whole foods and have packaged foods with added sugar as an occasional treat. Always read ingredients lists as well – it surprising how many packaged foods contain sugar!